Keep your message 100% positive. Negative messages will lose your audience fast, and make it more difficult to get them back.Your recycling presentation makes a powerful statement when you start with the facts. Since the 1950's Americans have focused on bigger, faster, &more. But Consumer Culture is not a quintessential American value. It is a behavior that was cultivated by business starting in the 1950's. The way you talk about recycling help people understand why recycling is important. After all, if it's not important, why bother? The first thing to recognize is that the population has increased dramatically. See: U.S. and World Population Clock and Gapminder - A fact based world view. This chart which illustrates the history of aluminum production shows how our ability to extract natural resources from the earth has increased exponentially over the last 65 years. But what is happening to those resources? Waste generation has increased 60.9% since 1960. We are wasting the earth's resources by putting them into landfills. 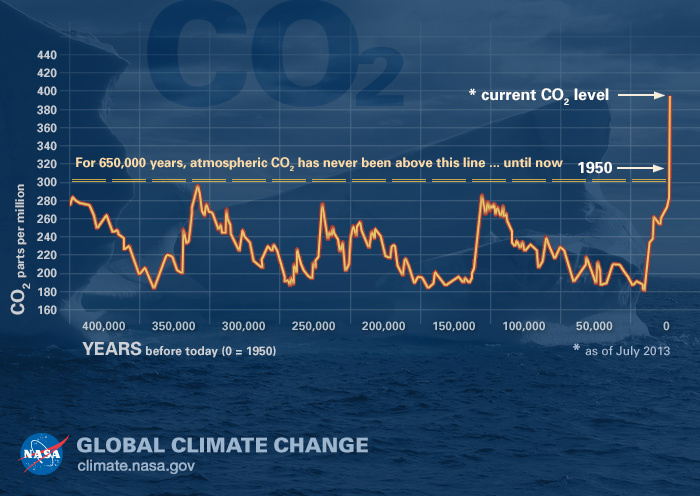 The level of CO2 in the atmosphere is increasing. Natural resource extraction consumes forests leaving an abundance of CO2 in the atmosphere. It takes more energy to transform natural resources than recycled material into usable products contributing to the rise in the earth's temperature. NASA provides hundreds of powerful images to illustrate the impact of climate change. Scientific statements embedded in stories about duty-based, engaged citizens are most effective in motivating people to recycle. Aluminum is made from bauxite. It takes twenty times as much energy to make aluminum from bauxite as it does to make aluminum from recycled aluminum. That's the difference between a nickel and dollar. In addition, bauxite is mined from mountains. What lives on mountains? Llamas, bears, foxes, eagles, ants trout, and people. Mining bauxite disturbs the habitat where these animals live, forcing them to crowd out the habit of other animals. This example illustrates how recycling saves energy, natural resources, animals and people. When you recycle aluminum, you not only save bauxite, which is a natural resource, you also save the habitat of Llamas, bears, foxes, eagles, ants trout, and people. Make Your Own Signs to help people send send their materials to Compost, Recycling, or Landfill.